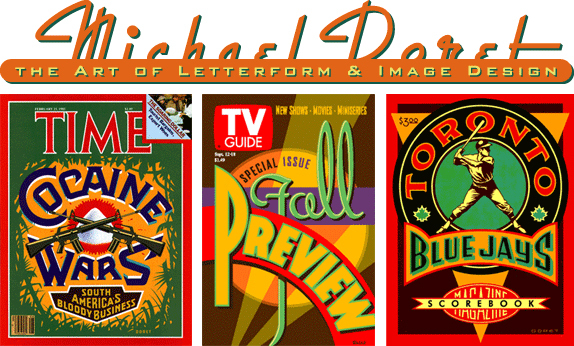 Michael Doret is one of the greatest designers-illustrators of our times. He has been surprising us for years with designs that takes us to imaginary trips throughout different periods of time: from the purest deco style to futurist designs, where he seems to play with forms and volumes. His designs are a mix of the past, present and future where the unexpected plays an important role. The process of how Michael designed our New Years Greeteing is explained by Michael himself: "I wanted to tell you my rationale for designing this piece the way I did. I wanted to suggest linkages between all things by creating visual links: so I created the linked 0s, the linked faces of man and woman, the connection between man and the planet, and the 2 and 5 that are almost mirror images of each other. I wanted to suggest something that has survived despite all the wear and tear it has sufferedthe extreme distressing of the art, as if it has been through some hard times, and is a bit out of register, but still beautiful. Its like when you find an old battered print, that is worn, scraped, and a little faded, but is still in one piece and whose beauty still shines through". This is a sample of how and why Michael Doret designs the way he does. In his website www.michaeldoret.com Michael Doret talks about his experience: "I'm a graduate of The Cooper Union in New York City, and opened my own design business shortly after graduation. Since then I've continued to run a small design studio - first in New York City, and currently in Hollywood, California. I've never wanted to become an administrator, so I've never expanded the size of my studio, and never had to resort to farming out the actual work to an employee or sub-contractor. What this means is that if you come to me because you like the problem solving abilities you've seen demonstrated in the work on this site, then you can be assured that it will be me who will see your project through to completion. With few exceptions the letterforms that you see in my work are uniquely created by hand. The work and the letterforms that you see here were generated from scratch specifically to solve certain problems, and are one of a kind. If you had a logo assignment you would see a few versions (exact amount would be determined by budget), not dozens, but each completely unique and unlike the one before all of them viable alternative solutions to the problems at hand. The nature of the assignments I take varies widely - it could be anything from a logo to a CD cover, from signage to a postage stamp, from a single letter to an entire font: anything where letterforms and images need to communicate something more than the sum of their parts. " MisterRetro published this on Michael Doret: "A graduate of the Cooper Union, Michael has run his own design studio for many years - first in New York City - and currently in Hollywood. An eight time winner of the New York Art Directors Club Silver Award, Michael is a specialist in logos and letterforms. His unique typographic vision blends elements of lettering, illustration and graphic design". misterretro.com/michael_doret.html. Chuck Greens section in IdeaBook.com states: "Michael Doret's work would look familiar even if you hadn't seen it before, as he puts it, The work falls into the tradition of, and has as it's inspiration such diverse sources as matchbook covers, theater marquees, enamel signs, early and mid-20th century packaging, and various other artifacts of US Pop Culture. Check out his Time Magazine covers and other feats of design". www.ideabook.com/008_news/dl_06_04.htm. I will finally want to thank Michael Doret for his friendship, his humbleness and his generosity supporting several projects I asked him to participate in and of which I will comment later on. I am an admirer of his work and his sense of friendship.